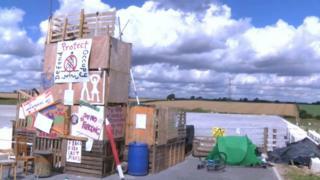 A drilling site at the centre of anti-fracking protests has been dismantled and returned to agricultural land. The Environment Agency said Rathlin Energy had surrendered an environmental permit for exploratory drilling for oil and gas at Crawberry Hill, near Beverley. Protestors previously targeted the site fearing it would be used for fracking. The agency has, however, granted Rathlin permits to carry out exploratory drilling near West Newton. A spokesman for the agency said: "When Rathlin decided not to continue using this borehole [at Crawberry Hill], it had to demonstrate that the site had been properly restored. "This has now been done to a satisfactory standard." Permits for the West Newton site were granted following a "rigorous assessment" of Rathlin's proposals to drill for gas. The spokesman said: "The company is proposing to drill a well for conventional gas exploration, to burn any gas produced during the drilling or testing of the well in a flare, and to discharge clean surface water from the site. "The company has not applied to carry out fracking, and the permits do not allow fracking to take place."